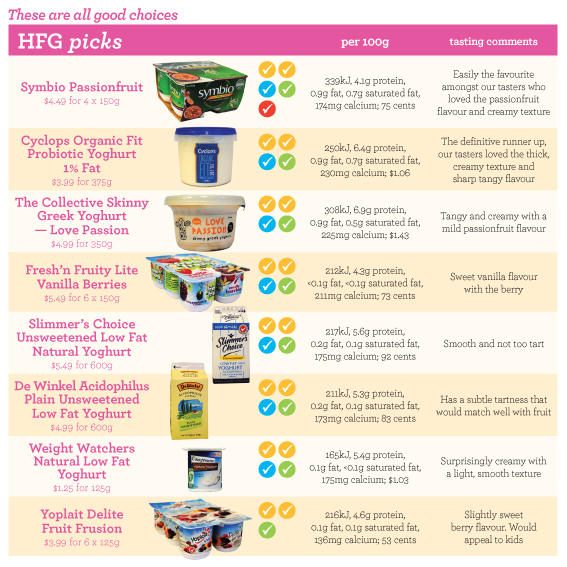 Most gourmet yoghurts have more saturated fat than we would recommend using with breakfast or as a snack. But there are plenty of low-fat yoghurts which are great for everyday use. Healthy Food Guide Senior Nutritionist Rose Carr shows us how to choose everyday yoghurt. Dairy fat contains a high proportion of saturated fat, which we’re advised to limit. Too much saturated fat in our diets is the main cause of high blood cholesterol — more so than trans fats or cholesterol from food. Scientists, however, are now questioning whether all saturated fats are the same. There is increasing evidence that the total make-up of a food may be more important than simply the amount and type of fat when predicting its effect on cardiovascular health. For example, it’s possible, but still under investigation, that the effect of saturated fats from cheese and fermented milk products such as yoghurt on blood fats and heart disease may be counterbalanced by the protein, calcium, or some other components in those products. Fortunately, there are plenty of low-fat yoghurts available so we don’t need to take any chances in the meantime. 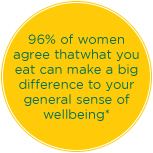 We think it’s best to follow the current advice to limit our intake of all saturated fats while the science is ongoing. This may be especially important as our intakes of saturated fat in New Zealand are still very high. Remember, too, the amount of fat in yoghurt will also affect the energy content. We recommend choosing yoghurt with 1.3g or less saturated fat per 100g, or even better, choose yoghurt with 1.3g or less total fat per 100g (that’s 2g or less per 150g pottle). Most adults are recommended to get 1000mg calcium every day, but for women over 50 and men over 70 that increases to 1300mg each day. Calcium is essential to build and maintain our bones throughout life. Be sure to choose yoghurt with higher amounts of calcium. We recommend choosing yoghurt with 170mg or more per 100g (that’s 255mg or more in a 150g pottle). While dairy sometimes gets a bad rap from people concerned about their weight, choosing a low-fat yoghurt will reduce the energy content. For anyone watching their weight we recommend choosing yoghurt with 400kJ or less per 100g (that’s 600kJ or less in a 150g pottle). 400kJ or less per 100g (600kJ or less per 150g pottle). Whether the yoghurt has been tested and delivers the required amount of probiotic up to the best before date.